European Union contractors are in control when it comes to plant security, because they have contracted out of plant theft. accept responsibility for the security of machines hired to them. They do not sign hire conditions that make the hirer responsible if a hired in machine is stolen. In the past two years UK contractors have indirectly spent about £250M to replace the 11,000 machines that were stolen and not recovered. How can UK contractors manage resistance from their suppliers? • Evaluate how much money your company has paid out in the past three to five vears because of machine theft. downtime, crosshire, admin, safety claims, insurance excess and increased premiums. • Ask security system suppliers what their product does, get customer references and demand to see the product demonstrated on your machines. this. Think about asking for an immobilisation system that shuts off the diesel fuel supply, hydraulics and machine electrics. • 92 percent of stolen plant is never recovered. Trackers provide super asset management facilities but will not stop your machine been stolen. Nor will a registration or identification system. British contractors are their own worst enemy. They are the ultimate customer of manufacturers and hire companies, but they need to take control. Patrick Sheeran is founder & CEO of Kosran. 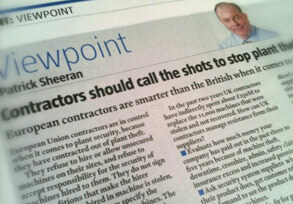 Taken from May 2011 issue of New Civil Engineer Magazine.